After the unspectacular self-titled 2005 album and then the nightmarish, near soap opera-like, implosion and break up of the old Stratovarius in 2008, fans had hope for a 'renaissance' of sorts from the distinguished Finnish power metal band. However, with Timo Tolkki gone and Matias Kupiainen in, that revival would have to wait. Before Polaris would hit the streets fans would have to make do with Tolkki's new creation Revolution Renaissance. They suffered through the uninspired and monotonous New Era, only to be reward with the much improved Age of Aquarius. What would Polaris hold forth? Would this be a return to the glory days of Stratovarius? Frankly, the answer is mixed. Polaris in substance is muck like Janus, the Roman god of beginnings and endings, it has two faces. In the first half, at least through 'Winter Skies,' Stratovarius begins a return to a form of melodic power and heavy metal. However, Timo Kotipelto seems subdued, the arrangements busy but average, and Jens Johansson keyboards appear to have the upper hand. The only exception is the better 'King Of Nothing.' Yet, the album seems to turn on the hinge of metal ballad 'Winter Skies' where Matias Kupiainen is finally allowed to stretch his wings. On Polaris, the post-Tolkki Stratovarius appears to be band in search of itself and a new direction. Fortunately, there is promise here as a return to their classic melodic power metal form is apparent on many songs. Unfortunately, there's not a whole lot that's memorable here. Here's hoping future efforts will be more distinguished. This work will probably be best appreciated by long time Stratovarius fans. 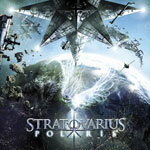 On Polaris, the post-Tokki Stratovarius appears to be band in search of itself and a new direction. Fortunately, there is promise here as a return to their classic melodic power metal form is apparent on many songs. Unfortunately, there's not a whole lot that's memorable here. Here's hoping future efforts will be more distinguished.